We all know the weekend starts at 4:45pm on Thursday, but what about going out in Chicago on a more traditionally tame Sunday, Monday, Tuesday, or Wednesday night? Whether you work over the weekend or just want to treat every night like the weekend, you can enjoy yourself without the need to rub elbows with tourists and “industry” types at Downtown clubs and lounges. If you’re looking for a helluva time that you definitely (probably) won't regret the next day, hit up Chicago’s best off-night bars. Early in the day, this Lincoln Park mainstay (and Eddie Vedder hangout) hosts a popular brunch buffet that’s stocked with fried chicken. The party keeps on rolling into the night, so throw back a few Bloody Marys and get ready to rock out with live-band karaoke, and hopefully a tipsy, goat-mumbling Eddie Vedder. 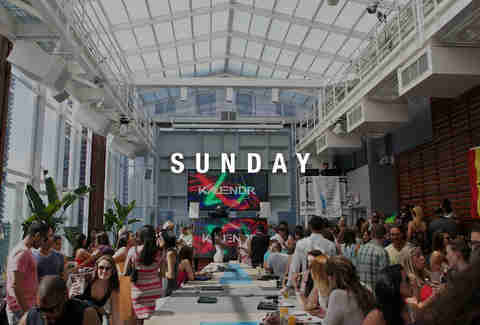 ROOF only throws its Sunday bashes throughout the summer -- that time of year when the sun is actually out -- which probably adds to the midday energy at this cranked-up day party. Sparklers, bros donning tank tops, dolled-up women rocking their best heels, and plenty of Corona bottles are all on display here. The music is loud, the views are great, and the vibe is fun. Every Sunday night at "Queen!," Michael Serafini's high-energy gay night, he and partner-in-crime Garrett David keep the weekend-party going by spinning house, disco, and tech on vinyl. Barbecue buffet. $3 vodka lemonades. Solid crowd. ‘Nuff said. Considering the massive lines you’ll encounter here on weekend nights, hitting the Slope on a weekday will make you feel like you’re freely waltzing into the joint through the kitchen, Swingers style. The bar doesn’t get too packed, instead drawing a thirsty crowd that shows up for $1 mugs of Hamm’s. If you’re looking to keep it on the level, there’s free skee-ball and karaoke to keep you occupied. Hosting the entertaining weekly "Salonathon," Beauty Bar is an excellent choice for those looking to get a little weird early in the week. Cheap beer-and-shot specials keep bar-goers lubricated, while a lineup of writers, musicians, and weirdos keep things interesting. In the same night, you can see live music, a contortionist, and a Fifty Shades of Grey parody-reading by a guy who is dressed in a dog costume. For real. Not only does Empty Bottle book quality bands on Monday nights throughout the year, but it doesn’t even charge a cover for the vast majority of them. The venue’s "Free Music Mondays" series can draw a packed house when there’s an up-and-coming band stopping in, which can sometimes feel as if you’ve suddenly time-traveled into a Saturday night show. Oh, and $6 for a shot and a beer isn’t too shabby either. 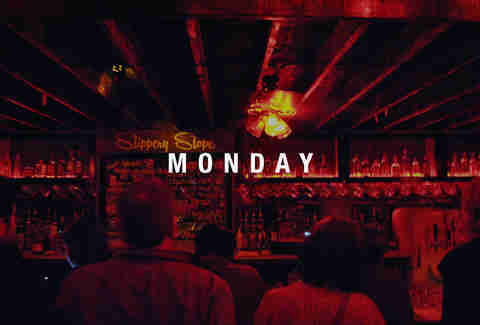 The Monday night crowd at Delilah’s isn’t always wall to wall, but it sure is a thrifty bunch with great taste in music. "Punk Rock Mondays" is the bar’s weekly bash, during which visitors can expect plenty of punk rock on the speakers, free games of pool upstairs, and cheap booze. Like, really cheap. Domestic beers-for-$1-and-whiskey shots-for-$2 cheap. After all, nothing’s more punk rock than being fiscally responsible. 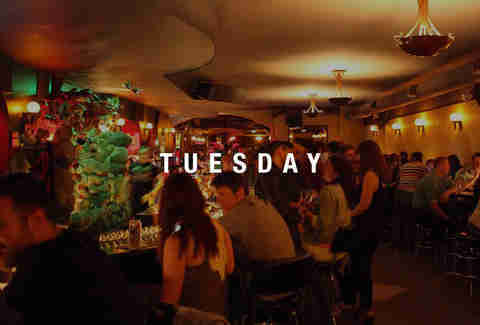 One of four bars that offer the same Tuesday night special, The Owl draws a packed house on Tuesday nights thanks to its ridiculous deal: select craft beer pints for $2 or $3. The menu changes weekly, but the crowd comes out year-round, because apparently craft beer aficionados will hike through a snowstorm in order to save a few bucks. Hey, if there’s one thing that’s worth hiking through a snowstorm, it’s definitely beer. Offering the same deal as The Owl (select craft beer pints for $2 or $3), Tuesday nights at Estelle’s are slammed like Andre the Giant at WrestleMania. Besides the great beer deal, you can score some pretty decent bar food -- like the avocado-topped Point Break burger -- and hit up the great jukebox, which is locked and loaded with LCD Soundsystem and Band of Gypsys. aliveOne offers the same deal as The Owl and Estelle’s on its bustling Tuesday nights (select craft beer pints for $2 or $3), but it also has something that the other two bars don’t: a jukebox that’s stocked with live-music albums. Which you’ll either love, or absolutely hate, because can we all just admit that live-music albums are worse than going to your date’s apartment and discovering dozens of mannequins? Say what you will about bros and broettes, but they sure do know how to party. Witness them in their natural, sports-saturated habitat at Joe’s on Weed, which throws a super-fun Tuesday night bash that’s fueled by serious drink specials: $2 vodka drinks, $2 domestic pitchers, $1.50 Bud Light and Coors Light cans, and $5 pizzas, among others. Yes, $2 pitchers are a thing outside of Flint, Michigan and heaven. 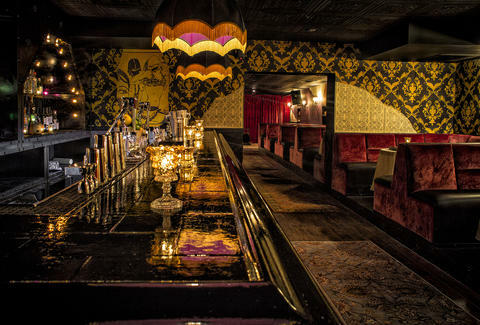 The throwback, vaudeville-inspired cocktail lounge above Black Bull is one of our favorite secret bars. However, it looks like the worst-kept secret in town on Wednesday nights, when scenesters, industry peeps, and thirsty locals stop in to check out live music and DJs at the weekly "Speakeasy" bash. Cole’s is the kind of no-fuss bar that really doesn’t need any event to keep it busy on any particular night of the week. 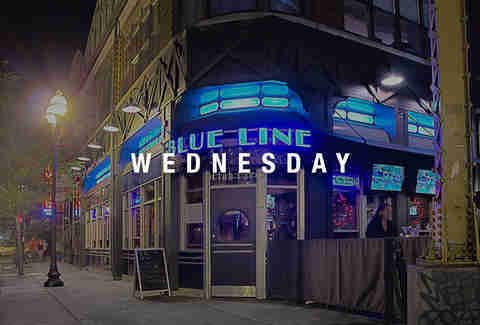 However, Wednesday nights are dependably happening because there’s a great standup open mic night in the back, and also because Logan Square locals like to go out a lot. It’s science. Spend enough time in Lincoln Park and you’ll soon realize that you’re trapped in a discombobulating vortex where every bar in the neighborhood is actually the same bar, with the same games on TV, Buffalo wing baskets, and mix of sloppy white-collared paper-pushers and overly thirsty DePaul coeds. Kincade’s knows this, and totally owns it by putting on rowdy Wednesday nights with its $1 domestic bottles special. Props. You may not like martinis, and it’s probably because they’re served in the stupidest glass ever made. On the other hand, you may be into drinking on a budget or just chatting up fellow martini drinkers. If that’s the case, swing by the Blue Line Lounge and get sauced on specialty martinis, which pack a punch and will set you back only $5 a pop. Raf has no problem with going out on Tuesdays and Netflixing on Fridays. Hit him up with movie recommendations: @raffosho.